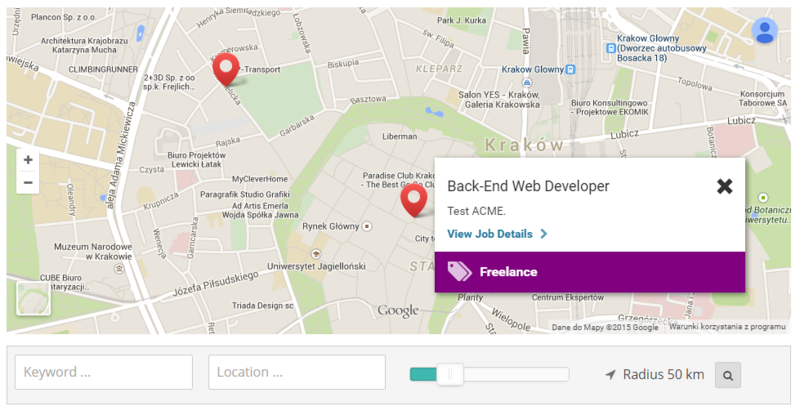 This shortcode allows to display interactive map (using Google Maps v3 API) with active Jobs, Resumes or Employers marked. location to which map should be centered, the value for this parameter is required, if you would like to center the map on London as a value enter “London, UK”. set default map zoom level, default value is 12.
how high the map should be, you should enter value in pixels only, for example 400px. Display map with list of active jobs. Display 400×400 px map with list of resumes. On the first image in this article you can see that below the map there is a filter that allows to search jobs/resumes/employers by keyword, location and radius, this is not part of the default map. If you would like to use the filter download the addon below, install it on your site and below the [wpjb_map] shortcode add [wpjb_addon_map_filter] shortcode (it does not have any parameters). Can you clarify how you install the [wpjb_addon_map_filter] shortcode? You need to first download it, then install like any other WP plugin from wp-admin / Plugins / Add New / Upload panel. Is anyone has the same problem than I ? I’ve done this but the map looks transparent and you can’t see it properly. Any ideas please? James, edit the Page where you have [wpjb_map] shortcode, in the text editor click “Text” tab, the [wpjb_map] is wrapped inside <pre> tag, you will need to remove it. Are you there Greg? You’re usually quick with your replies. Hi, sorry i sometimes forget to reply to comments, i prefer support questions to be submitted via email. Either way in your case it seems that the map does not load because it would need to place few thousands elements on the map, if you email me site access i’ll see if i can do something about it. Please add the auto_locate=”true” to this documentation. 😉 I searched for it and didn’t find anything about it. Thanks, i didn’t noticed we do not have this document updated, i will add it soon.